Romano vs. Simonetti “I Quit” Match headlines ElkMania 5 this Saturday night! BEVERLY, MA, September 23, 2017 – Professional wrestling returns to the Beverly/Salem Elks Lodge on tomorrow night on Saturday, September 23 for the fifth installment of our preeminent event, ELKMANIA 5. Doors open at 6:00 PM. Special bell time is at 6:35 PM. Tickets are $10.00 in advance and are on sale at Silver Moon Comics & Collectibles located inside of the Museum Place Mall, Salem, MA. Tickets will be available at the door for $12.00. Creative Salem members will get two dollars off their admission at the door. The main event will feature Salem’s own Derek Simonetti challenging “Bitter” Buddy Romano for the Bay State Championship in an “I Quit” Match. One year ago, Buddy Romano announced his retirement from wrestling and surrendered the championship, after he was ordered to defend the belt against Derek Simonetti. Simonetti went on to win the title and defended it with honor against all comers. Highway robbery occurred at historic Fenway Park in July when Romano shockingly came out of retirement and regained the title in a four-way match, however, he never pinned Simonetti. This first-time encounter features the only two men to ever hold the coveted title. Adding to the evening’s action will see as “The Gentleman” Burke Beckett puts his luscious locks on the line against the goat with the most, Freakin Flax in a ‘Mask vs. Hair match. “The Maniacal” Jack Krueger will defend the All-Star Title in an open challenge and so much more! ElkMania 5 promises to be a night that you don’t want to miss! All proceeds from the event will be donated to the Elks National Foundation which helps youth develop lifelong skills, sends students to college, meets the needs of veterans and supports charitable works in the community. 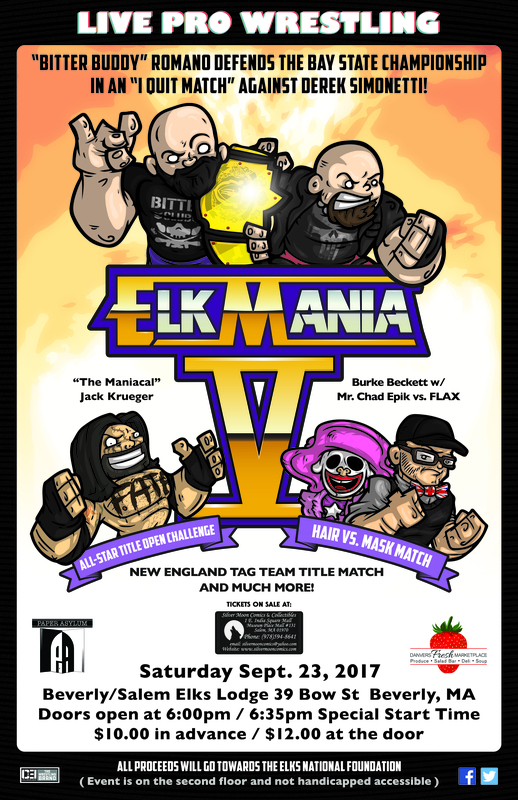 ElkMania Promotions is a Massachusetts based professional wrestling promotion. Its operations are based in Salem Massachusetts and are dedicated to providing quality family entertainment for a good cause. Please support our generous sponsors, Danvers Fresh Marketplace, Badabing Barbershop & Shave Parlor and Paper Asylum in Beverly, MA.